Crews-Farrell-Mead Wilbert and Shore Wilbert are family owned and operated since 1971. We manufacture and supply a large variety of precast concrete products to various industries. We can deliver our products to most of New Jersey and New York City. We also deliver to southern parts of New York State. In business for over 40 years, we have gained the experience and expertise to produce high quality precast concrete products. Our fleet of trucks and experienced staff has allowed us to provide excellent service in the field. We provide many services to the industry with the primary one being the manufacture and delivery of the Wilbert Brand Burial Vaults. Crews-Farrell-Mead Wilbert and Shore Wilbert are licensed Wilbert® burial vault, urn vault, cremation urn, and graveside service company that has served the Tri State area since since 1971. Our family owned business manufacturers and suppllies a large variety of precast concrete products to various industries. In business for over 40 years, we have gained the experience and expertise to produce high quality precast concrete products. Our fleet of trucks and experienced staff has allowed us to provide excellent service in the field. It is our mission and goal to use the finest materials in our manufacturing process and to provide the most advanced service in delivery and cemetery setup found anywhere in the United States. Wilbert® is the world leader in the manufacturing & delivery of concrete burial vaults. The value of a Wilbert brand burial vault can be measured by the peace of mind it ensures you with. Wilbert burial vaults are structurally sound and finely-crafted. They provide you with unsurpassed quality workmanship that is second to none. 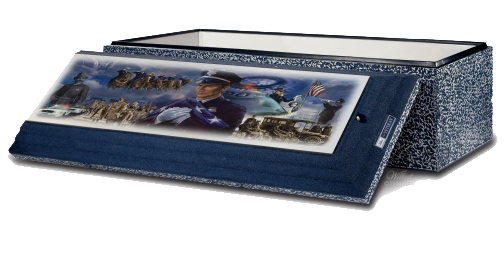 Our burial vaults also provide you with a variety of protection and personalization options. Wilbert® Burial Vaults and Urn Vaults are designed to surround a casket or urn in the ground, protecting the deceased's casket or urn from the weight of the earth and from the heavy cemetery maintenance equipment as cemeteries perform routine maintenance. Also, most cemeteries require some type of 'Outer Burial Container' to keep the grave from sinking in. Wilbert® Burial Vaults and Urn Vaults perform both of these functions admirably. Remember, the vault is the only part of the Funeral Service that is designed to function from the minute it is sealed until eternity. The importance of the vault choice cannot be overemphasized. Crews-Farrell-Mead Wilbert and Shore Wilbert offers Wilbert burial vaults and cremation urns to most of New Jersey and New York City. Wilbert offers the Above Ground with Lowering Device (AL) burial setup. It includes graveside grass and casket lowering device. A 12x12 tent is available to be set up by our staff at the gravesite for funeral services. The tents cover the burial area and provide a comfortable place for families to gather during the funeral. Four chairs are provided for each definite tent. At no charge to the family, Wilbert and our licensees donate a customized Wilbert Stainless Steel Triune® burial vault. If the choice is cremation, we offer a selection of four urns, as well as a Stainless Steel Triune urn vault for memorial tribute. Wilbert Funeral Service (corporate HQ) has awarded Crews-Farrell-Mead Wilbert and Shore Wilbert with "Ultimate Service Provider"
There are four service levels: Minimum Service, Basic Service, Premium Service, and Ultimate Service Provider. To be classified as an Ultimate Service Provider, one must receive at least 75 points out of 88 points; a higher score is attainable when bonus points are earned for exceptional achievements. Points are collected by category, including tents, chairs, greens, lowering device, vaults, employees, and trucks and delivery.